MoonMarble.com - George Pavliscak - "Black and Sparkly Dichroic Twistback Swirl"
Art Glass → Contemporary Handmade Marbles → George Pavliscak - "Black and Sparkly Dichroic Twistback Swirl"
This is a contemporary handmade marble by artist, George Pavliscak. 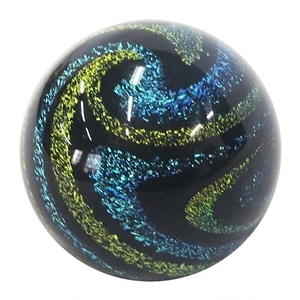 This marble has a black base and ribbons of green blue sparkly dichroic that swirl around the marble and twist back the other direction. Approximately 1 1/4" in diameter.